Lightly oil a large bowl and two 450g/1lb loaf tins. In a small bowl, dissolve the yeast in 290ml/10fl oz/1 cup plus 2 tablespoons lukewarm water. Put the flour and salt in another large bowl and make a well in the centre. Add the yeast mixture, butter and honey and mix together, using a wooden spoon, to a rough dough. Turn the dough out onto a lightly floured work surface and kneadfor 5-8 minutes until the dough is smooth and elastic and springs back when poked. Transfer the kneaded dough to the prepared bowl, cover with a clean, damp tea towel and leave to rise in a warm place for1 hour, or until doubled in size. Turn the dough out onto a lightly floured work surface. Knock the air out of the dough by punching it with your fist and expel the gas by pressing down onto the dough, then folding it back on itself like an envelope. Return the dough to the bowl, cover again and leave in a warm place for a further 30 minutes, or until it has doubled in size again and no longer springs back when poked. On a floured work surface, divide the dough in half and shape each piece into a ball. Cover with a clean, damp tea towel and leave to rest for a further 10 minutes. Shape the dough into blocks and put in the prepared loaf tins. Cover again and leave in a warm place for 50-60 minutes until almost doubled in size. 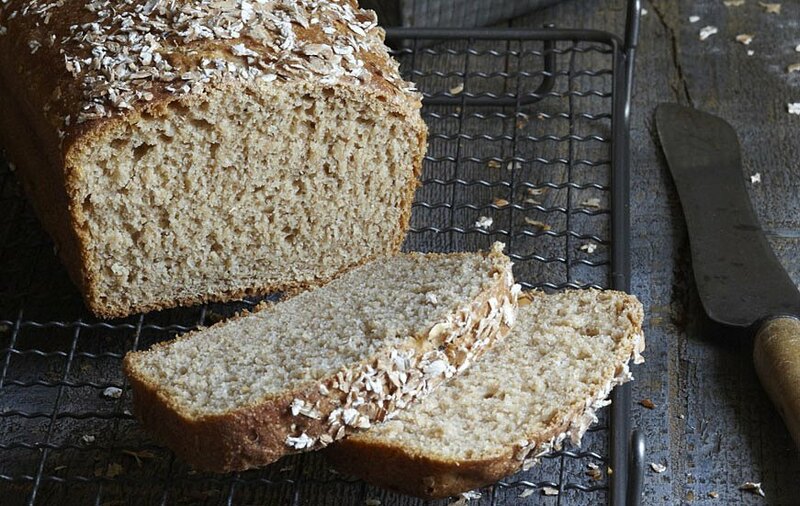 Preheat the oven to 210°C/410°F/Gas 6-7.Dust the loaves with a little spelt flour or spelt porridge flakes, if using. Turn the oven down to 190°C/375°F/Gas 5 and bake for 40-50 minutes until golden on top and hollow-sounding when tapped. If you prefer a crustier loaf, bake for 35 minutes, take the loaves out of the tins, then return them to the oven for the last 10-15 minutes of the baking time, sitting them directly on the middle oven shelf. Transfer to a wire rack to cool. Warm proving is fine and will produce a good result but for a greater depth of flavour, you could try cold proving. For example, you could make a dough in the morning, leave it in a cool place all day, then finish and bake it in the evening, allowing a cold prove of some 6 - 8 hours. Artisan bread making is usually done over 2-3 days of `fermentation' especially with sourdough.